European Commissioner for Trade Cecilia Malmström has told UNIAN ahead of her visit to Ukraine about the advantages of DCFTA for the Ukrainians and Europe’s planned actions toward Russia given it pursues with implementing new sanctions against Ukraine due to DCFTA coming into force. 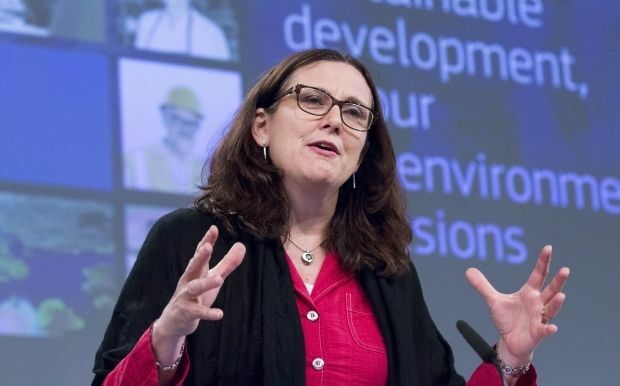 Commissioner Malmström will visit Ukraine on November 12-13 to meet the Prime Minister, the President, the Minister for Economic Development and Trade, and the Foreign Minister. Implementation of the Ukraine – EU Deep and Comprehensive Free Trade Area from January 1, 2016, will be on the top agenda of Ms Malmström’s visit. Ahead of her visit Cecilia Malmström has told UNIAN what the advantages are of the DCFTA for the Ukrainian producers, what should be done to make the Ukrainian products competitive on the European markets, and how the consumers will profit. She also stressed the need for the Ukrainian authorities to take practical steps in the implementation of important reforms and elaborated on the actions of the EU toward Russia, which shows concern over the Ukraine-EU DCFTA. What is your agenda and what would you like to achieve during this visit? It is a trip to show support to Ukraine and to discuss the upcoming implementation of the DCFTA. In this regard I have my second question about DCFTA. Is there general understanding what kind of products can be interesting and will be successful at the EC market? Is there a prognosis on how Ukrainian import to the EU can grow or not grow in the nearest five to ten years? It is very difficult to make those prognoses, bearing in mind a difficult situation in Ukraine and arm-wrest you’re having in so many parts of your country. We opened up for autonomic trade preferences already a year ago, so that has been an allowance of Ukrainian product already in the European market. We will now open up for more economic integration, taking away other obstacles and non-tariff barriers, which will facilitate for Ukrainian products to come in. It depends of course, on what is competitive. You have quite competitive agriculture production. I would imagine that it will be the in the focus, but it can also be machinery or pharmaceuticals. It is very hard to say. What we do know also is that the two other countries who have implemented DCFTA – Georgia and Moldova, specially, Georgia, after one year we see very-very positive development in growth and increased trade between the EU and Georgia. Slightly less in Moldova, but there is also a positive trend there. Despite preferences, which EU gave to Ukrainian products, this year we see that Ukrainian export to the European market decreased by more than 30%. Why do you think it happened? Ukrainian exports have fallen globally, not just towards us, and that is because of a lot of external factors - the Russian embargo, the war that is going on in your country and a general economy as itself, prices going down globally on some of your export products – metals, oil, agriculture products – also play into it. I can’t promise, of course, that from January 1 everything will change overnight, but we will engage in a long term partnership, facilitating for Ukrainian products to enter, working with you to help you to have a stronger economy, helping you to rise standards of your products, as sort of high quality stamps, so they can be exported not only to Europe, but also to other countries in your neighbourhood and making sure that you do the reforms that are needed, also to make full use of the Agreement. I have almost the similar question but regarding the European export to Ukraine. Are there any prognoses how it can change the Ukrainian market? Can it influence the prosperity of the Ukrainians? I think in two ways it will be good for you. First, if your consumers, the people of Ukraine, have more access to more products, it is good for them and, hopefully, some of them, because of tariffs, will be cheaper. That is good. They will have more choice, more products at the lower cost. And then, of course, you can ship without tariffs and other barriers all kinds of machinery you could use to rise the technological advancement in your agriculture. For instance, you can use your markets internally in a better way; it is a sort of advance in the value chain. For instance, in the agriculture. This will open new possibilities. We have seen that in Georgia as well. What are your expectations of the outcome of the trilateral consultation regarding Russian concern over the DCFTA entering into the force? We’ve already had many-many meetings at the technical level, also at the ministerial level, and it will be one more very soon. We do not have a date yet. Our expectations are that Russia will refrain from putting more sanctions and from withdrawing their preferences that Ukraine has in the CIT agreement with them, and that they will allow for DCFTA to enter into force as we decided it will, and Russia will have to accept that. We have said that, if Russia has particular concerns of a practical character when it comes to the implementation of the Agreement (veterinary certificates, some [kind of] collaboration), I mean very technical but important issues, we are willing to help Russia. So far we have not reached an agreement on this sensitive issue but we are still optimistic that we can find a way. But we’ve already heard a recent statement of Russian Prime Minister Dmitry Medvedev that Russia will increase levels of customs-tariff protection against Ukraine, and it will impose other economic sanctions. Do you really believe that you can reach an agreement with the Russians? We have to at least try. We will be trying. But I have full support of all member states including the Commission, and your government has repeated this as well – the Agreement will enter into force from January 1 next year whatever Russia says. If we have an agreement with them before – [it’s] fine, but it [the Agreement] will enter into force anyway. Regarding the Russian proposal concerning the cooperation, which could lead to the formalization of EU-Eurasian Economic Union relations... What is your opinion on this and under which condition will it be possible for the EU to recognize the Eurasian Economic union? First of all, we need to make sure that the Minsk agreement is implemented fully and that the EU-Ukraine DCFTA will apply and that Russia does not do any measures towards Ukraine. Then we have quite a lot of problems in the WTO with Russia, so we need to solve them. All of this is conditions, before we can engage in a more formal way with the Eurasian Union. Coming back to the DCFTA, what kind of mistakes the Ukrainian business and government make when entering into the EU market? What must be done to avoid such mistakes? I’m not sure if I can give an example of any mistakes. It is always, of course, difficult to enter into a new market, you have to be competitive and you have to have products that are in demand. There is definitely a potential for Ukrainian products, especially in the agriculture sector, but also in the other [sectors]. Reforms in Ukraine are necessary as well. Because, if you want to attract European investment which you need for jobs (and the European companies want to invest in Ukraine) a predictable business environment is needed. You need to make sure that the Ukrainian side’s fight against corruption is progressing, that there are predictable, good, transparent, non-discriminatory conditions for business to act, in order to make a good investment environment. This will take time, and we will help you, but this needs to be done, and this can be done only by Ukraine. Talking about European producers and companies, can Ukraine become a new production platform for EU producers because of cheap labor? No, I don’t think this is what we are looking at. You have human capital, you have technical knowledge, highly educated people and specialists in many fields. So I don’t think you should seek to compete because of cheap labor rather than seek to compete because you have skills and products and an attractive market. What we see is that it has a huge potential to grow. We will organize, together with Business Europe, a business event here in Brussels at the beginning of next year, where I will make inaugural speech in order to try to see if we can promote cooperation between European and Ukrainian companies and talk about investment in Ukraine. It will be in February. Can Ukrainian and European businesses coordinate their efforts in order to be successful? It is not for us to say but for businesses to discover what to do. What Ukrainians need to do is to continue the reform path, fight against corruption, [create] good business climate. A business forum can be one opportunity for companies to meet and exchange views to see how they can cooperate.